This June Podemos helped the Socialists kick the Spanish conservatives out of office. But for Íñigo Errejón, defeating the oligarchs in the long term requires a new "national-popular" strategy. Six months after the center-left Socialists (PSOE) formed a minority government in Spain, the administration’s future looks increasingly in doubt. Prime Minister Pedro Sánchez is refusing to rule out fresh elections next May as the parliament remains deadlocked over the budget agreement reached between his party and Podemos. The progressive deal — which includes a 23 percent hike in the minimum wage, rent controls, and a 3 percent tax on big tech companies — lost its majority after Catalan nationalists withdrew their support. With jailed pro-independence leaders who organized last year’s contested referendum on trial in the New Year for rebellion, Catalan parties are demanding that Sánchez make a shift on the question of political prisoners before they back his budget. Since 2016 Errejón has upheld the need for Podemos to engage with the PSOE in the institutions, clashing with party leader Pablo Iglesias over the issue at the party’s Vistalegre conference. Yet, as he explains to Eoghan Gilmartin and Tommy Greene, betting on such institutional cooperation also opens up a series of contradictions that need navigating. The most important of these is how to combine such engagement with the center-left with Podemos’s own long-term vision of building a national-popular bloc capable of taking on the Spanish oligarchy. The political landscape in Spain has changed rapidly since the crisis in Catalonia at the end of 2017. If back then the Right seemed to be advancing inexorably, events soon led to the ouster of conservative prime minister Rajoy and the formation of a minority PSOE government. How would you explain this changing landscape? Spanish society is broken and it has yet to discover the bearings that would allow it to conceive of a shared future. There are two major initiatives currently on the table for reconstructing some form of “general will” out of these fragments. Conservative forces want to unite Spaniards against Catalonia and Catalan nationalism, whereas progressives are aiming — or should be aiming — to articulate a collective project for the Spanish people, based around the idea that greater democracy and social protection go hand in hand. We have to recover the rights that were lost during the crisis. These two agendas are vying for supremacy with one sometimes gaining ground at the expense of the other and vice versa. When in 2016 Rajoy won the chance to continue in office after two [inconclusive] elections within six months, this did not owe to any ability of his to reform the Popular Party [PP, right-wing] or to unite people around a project for the country’s future. He took office mainly due to the inability of progressive forces to reach an agreement. He simply had to say: “Look! The alternative to me is disorder and chaos.” Few favored another PP government, but they looked at the opposition and saw forces that were unable to put what they had in common ahead of what separated them. Finally, the judgement in the Gürtel Case [a high-profile corruption probe involving former senior figures from the PP] forced the Socialist PSOE to bring a motion of no confidence against Rajoy’s minority administration. We in Podemos always argued that the numbers existed in parliament to pass such a motion, but the Socialists had to have the political courage to reach an agreement with us knowing that it would be opposed by many of the major powers in Spain. For the oligarchy, any coalition was possible as long as it did not involve us or depend on the support of the Catalans. When in the end the PSOE decided to move against the PP, it was able to secure a negative coalition, brought together out of the need to condemn Rajoy. These very distinct forces [including conservative Basque and Catalan nationalists] did not agree on a program for government, but simply on defeating the PP. In this sense, the recent budget agreement reached between PSOE and Podemos goes one step further towards constructing a positive progressive bloc. In fact, it includes measures that go far beyond a simple pact over accounts for 2019, for instance the 23 percent hike in the minimum wage. It thus sets out the potential basis for a broader legislative agreement that, after years of cuts and setbacks in social rights, would push through expansive [anti-austerity] measures aimed at restoring households’ disposable income and thus stimulate the economy. This agreement still needs to get parliamentary approval. In recent weeks, Catalan nationalists have stated they are unwilling to support the budget, after the jailed political leaders who organized last year’s independence referendum were charged with rebellion. Do you think the agreement will indeed pass, or is PSOE prime minister Sánchez leaning towards abandoning any fight over the budget and instead calling early elections? I could be wrong but right now I do not think the government’s first preference is for elections next spring. There are still a number of months before the final vote on the budget and the moves from the various parties [whether from the government or the Catalans] have to be read as maneuvers in these negotiations. Clearly this is a fragile government and it is confronted by a conservative bloc whose internal competition is pushing it in an increasingly reactionary direction. Together with the ongoing conflict in Catalonia, this is producing an escalation of tensions and so we have to be very cautious about the potential duration and stability of the current government. That said, the budget agreement is too important to simply abandon. It offers people an alternative direction for the country and so if PSOE won’t take the lead [in securing it], Podemos must. Since Sánchez took office, relations between Podemos and PSOE have been put to the test. You have consistently defended the need for both parties to develop a relationship based more on “virtuous competition” rather than outright hostility. How do you consider this relationship as having played out so far under the Sánchez premiership, and how do you see it developing over the coming months? The idea of “virtuous competition” is not simply something I came up with. But in a sense, it is what the numbers dictate: we have only managed to take office where we have reached agreements with the PSOE. In all the cities where we and our allies control the councils (Madrid, Barcelona, La Coruña and Cádiz, etc. ), we govern with the support of the PSOE. Similarly, in the various regions where the PSOE govern, they depend on our support. The only exception is in Andalucía where the Socialists [led by PSOE centrist Susana Díaz] have been staunchly opposed to doing deals with us. The current political field is very divided and the only possible governments are those based on agreements between different forces. If the idea of a single party winning a majority is a distant possibility, it is important that the various forces are honest about who they are willing to work with. I have always maintained that we and the PSOE have to reach agreements. This is not an ideological position but a strategic one. It is not a question of believing in the historic role of the Socialist Party but of being confident in our ability to determine their direction. Many comrades talk about not being able to trust the PSOE, but politics is not about trusting the good intentions of other actors. If you can trust their intentions, they are comrades. Instead, we believe in our ability to reach agreements that can advance the country. Virtuous competition means that there are two battles taking place simultaneously: the battle to ensure the progressive bloc gains control of the government and the battle over who leads this bloc. This might seem like a contradiction, for your partner is at the same time the force you compete against the most. In this sense, it is crucial to distinguish between the logics of two different parties. The first requires cooperation to defeat the Right and then after that, when we [Podemos and PSOE] are cooperating, we have to compete to show which party has the best ideas and proposals, which is most audacious and best able to advance an alternative to neoliberalism. The progressive bloc in Spain is now increasing its [social and electoral] reach. A year ago, we were two forces that only fought each other in opposition, but now we are showing that we can work together to secure social gains. Yet I’m not naive. At the same time there clearly is a dispute over who leads this bloc. This second battle is crucial because if we do not take the lead, if we are not the ones directing this progressive bloc, we have a lot of historical evidence that the limits to the PSOE’s reformism will show when they come up against the power of the oligarchy. At the moment when the Socialists have to confront the major economic powers, they normally retreat. And in Spain, as in the rest of Europe, the potential for significant reform depends on taking a clear stand against the oligarchic powers. Today reformism and social harmony are not possible, even in terms of upholding social policies that were considered moderate thirty years ago. We have to be clear: popular sovereignty and the savage, unaccountable power of finance and other private interests are in contradiction. You have to define yourself in these terms: are you a political force which tolerates this despotic power, or are you a force unequivocally on the side of popular sovereignty and democracy? When Podemos emerged five years ago, its initial surge was accompanied by a discourse which claimed the principal division in Spanish politics was not left against right, but the people against the establishment, or those at the bottom against those at the top. In contrast, the current political agenda seems more centered around the question of parliamentary blocs or alliances. The risk for Podemos, here, is that it could be subordinated to the PSOE within a progressive bloc. How can this be avoided and how can you combine the populist logic, which has brought Podemos such success in the past, with the need for cooperation on the Left? In Spain right now the populist logic does not have the same weight as it did before. Yet in the rest of Europe the opposite seems the case. Why is Spain the exception in this sense? It is a contradiction which I find difficult to resolve. Europe is in the midst of a “populist moment.” Across Europe people are demanding security and belonging and, where progressive forces cannot provide this, they are turning to reactionary ones. The only question is whether it is we who will construct an idea of “the people” as a civic community standing for popular sovereignty and social justice or whether the reactionaries will articulate one based on race, ethnicity, and essentialism. They want to construct “the people” against the weakest members of society [immigrants, refugees], persuading people to concentrate on those below them and looking towards the past, whereas we want to construct a popular front against the most powerful. This is the most important struggle in Europe today — and in Spain too — but, at the same time, the immediate day-to-day politics here is increasingly defined around parliamentary divisions. In part this is because our political system is not a presidential or majoritarian one, but rather a proportional one, and so frames political debate more in terms of the institutional logic of left and right. This operates as a means of conserving the existing political system. Many of our critics have claimed that by downplaying the left/right distinction, we were renouncing our principles, but a political system organized around the left/right division is much more reformist and institutionalized than one organized around the people/oligarchy division. For this reason, I have always sought to define Podemos as a national-popular force and not a left-wing one. We have to be the political force which can unite a project for national renewal with the material security and social rights of those at the bottom. Yet Spain’s parliamentary system has driven political debate towards a more institutionalist key and away from a populist one. This change also reflects the fact that the economic situation in Spain has improved to a certain extent. Even if many families have yet to experience it, there is a perception that worst of the crisis is over. In this sense, anti-establishment feeling is no longer as dominant. Also, during our initial surge in 2014 it was very important to clearly differentiate ourselves from the established parties. Yet, after repeated elections in 2015–16, and with a growing sense of voter fatigue, people did not want us simply to show how different we were, but also that we could secure advances. And this required institutional agreements. It is as if the pendulum between populism and institutionalism or between confrontation and agreement, if not swinging totally towards the opposite pole, currently has both elements in play. Whoever says this is simply a question of confrontation is assuming that we remain in the same political moment as in 2015, which is just not credible. The difficulty is how to combine both elements. The immediate or tactical dilemmas of how to position the party in the institutions, how to engage in media-driven debates, or run an electoral campaign, are pushing towards a more institutionalist logic of left versus right. However, the longer-term strategic tasks of how to reconstruct Spain as a country continues to follow a populist logic of confrontation. To combine these elements is extremely difficult because immediate day-to-day tasks tend to gain priority over slower, longer-term ones. Political parties are better designed for more immediate interventions. Antonio Gramsci has a great line which Mao later adopted: “in ideological combat you have to clash where the enemy is strongest and in political combat where he is weakest.” Tactical combat requires concentrating on the point where it will be easiest to score a victory but on the strategic plane of ideology and culture you have to attack your adversary where he is strongest, targeting his core ideas. And it is not normally parties which are best designed for such a task, but rather civil society organizations and social movements. Intellectually, the problem is easy to resolve by saying we should combine both at once, with a party that follows the script of a movement. I can accept this, but I do not know any examples in the world today that have achieved that. Manolo Monereo has characterized populism as the form of class struggle in our postsocialist age, i.e., an age heavily marked by the historic defeat of the labor movement in Europe. Political forces like Podemos and La France Insoumise have emerged at a moment of deep crisis for neoliberalism but within societies that lack strong forms of collective organization and identification. What are the key challenges we need to confront in terms of constructing a stronger ideological and social bloc over the longer-term? Before answering that I need to say I do not agree with Manolo’s characterization because, in all classical populist movements, labor played a fundamental role. The “backbone” of Peronism in Argentina was the CGT union. It is historically false to say that where the workers’ movement is strong, there is no space for populism. Look at classic examples across Latin America: Juan Velasco Alvarado in Peru, Getúlio Vargas in Brazil, and the case of Perón. In each, the labor movement played a key role. Even in the US you could look at the case of the Populist Party in the early twentieth century. I would also reject the idea that populism is simply some postmodern phenomenon. Most successful revolutions have advanced with discourses that identified the interests of the nation with those of the least-favored sectors of society. Nearly all the revolutionary leaders with whom the European left identify were primarily national-popular leaders. Ho Chi Minh was, first and foremost, a national independence leader who was able to connect the demands of the poor and dispossessed with the goal of national liberation. The Left has only been able to win when it has positioned the labor movement or the dispossessed at the heart of a broader national project, thereby succeeding in making the interests of the workers and of the country coincide. But it is also true that contemporary societies have undergone a brutal process of fragmentation and atomization. One of the main forces that produced forms of community and collective identity were the unions and wider working-class organizations which over the last thirty years have been largely eroded. As a country at the periphery of the European Union, Spain has been pushed towards a model of economic development based around deindustrialization and cheap services. We are a country which builds houses and sells cheap beer to tourists. This transformation of production has been accompanied by a legislative assault on workplace organization that has stripped workers of their powers for collective bargaining. We have also seen policies aimed at destroying the actual physical spaces around which communities were based, such as the destruction of traditional working-class neighborhoods. These neighborhoods had public squares, civic centers, and neighborhood associations but have been replaced with new areas for workers where the only physical spaces for socialization are shopping malls. By destroying the previous social fabric, the Right’s neoliberal policies ensure that even when they lose elections, the Spain they leave behind is one in which the communities, collective narratives, and practices have been broken. In this sense, when we talk to people about having to exit the crisis together through cooperation and solidarity, for many these are only words because in their daily lives, they have no experience of this. Probably their parents had jobs with collective bargaining and a sense of future security but for the younger generation this has never existed. Faced with such atomization, the people will have to be constructed politically. The unity of those below, or of “the many,” is not a given and cannot be found in an excel spreadsheet that aggregates individuals by income level, profession, or what neighborhood they live in. Instead such popular unity is a political objective that requires discursive construction. We have to create a collective ethic, a collective horizon through new shared myths, narratives, and symbols that can bind together people who today are separated and dispersed across the social field. This will require new popular practices and the production of political figureheads, songs, films, cultural reference points as well as new collective spaces and organizations. In terms of Podemos’s specific role, when we are able to govern, at whatever level, we have to leave behind stronger communities and create the conditions for renewed social organization. For example, as we continue working with the PSOE, one objective has to be to change the labor laws and restore collective bargaining rights. With workers in precarious sectors of the labor market, such as hotel cleaners, seeking to organize and gain collective recognition, we have to create the institutional and legal conditions that will enable this. Similarly, in Spain right now there is a gag law which imposes brutal fines on people for concentrating in any street or public place without requesting official permits. This objectively persuades people against collective action. It has to be rescinded so that collective organization becomes easier again. If we can achieve these types of reforms, then bit by bit we can do the same as neoliberalism did but in reverse: slowly change the [hegemonic] common sense in Spanish society, so that it is obvious to everyone — no matter who they vote for — that to organize is useful. Neoliberalism tells us that it is easier to get ahead as an individual than as a collective. We have to shatter this idea by striking at the practices which force people to see the world in this way. Corbynism has marked out another path towards winning state power at the national level for a transformative project. Firstly, what are the advantages of not having to work within the framework of an establishment party? And, conversely, what are the difficulties and challenges you face when you do not have a tradition — like, for instance, the labor movement and the British Labour Party — sustaining your political project? I instantly identified with the slogan “For the many not the few” — Corbyn is, in this sense, saying the same thing as we are and for me he is a compañero. He has initiated this route within an already existing party, whereas we created our own. But in this respect, I am very pragmatic and I do not have a clear preference either way. A party is a monster that devours and ages you rapidly. We have aged very quickly indeed, and we have adopted ways of arguing, deliberating, organizing ourselves and of understanding politics both internally and externally that are similar to other parties. Because at the end of the day a party is a party. So, I don’t know whether Corbyn is more encumbered and limited than we are because he launched his project within the Labour Party, or whether we are because we began ours outside of a traditional party framework. We began from the outside because we believed it was impossible to do so within the traditional parties. If any of the traditional parties — including the United Left — had made an opening to us, I fear the populist hypothesis would have been deactivated. Luckily, they weren’t attentive or agile enough to do this. In modern and complex states, an alternative from the outside only develops when the state’s own integration mechanisms collapse. If those mechanisms work, then that alternative never develops. I sometimes think political transformations are as much a product of the complacency and inability of those at the top as they are the virtues of those at the bottom. Without this complacency and this moment of institutional collapse, there is never a chance for an alternative from the outside to develop. We do not exist because of our “brilliance” but because of a set of social conditions and the intellectual and moral crisis of Spain’s elites. Our outside, “from zero” approach was formulated in this context. It is true that this has made us more agile in the electoral battle. We began in the 2014 European elections and by December 2015 we had won over five million votes and 20 percent of the Spanish electorate. This would have been impossible had it not been for this flexibility that being a political force without tradition affords you. Tradition makes it difficult for you to advance rapidly. However, it also sustains you and stops you from falling. Tradition produces faith and loyalty. In Spain, we had a very difficult dilemma, with respect to what you say about tradition, which Podemos cannot resolve, but which interests me a lot. If we don’t establish a national-popular democratic tradition of our own, we will end up retreating into the typical aesthetic and cultural tropes of the historic left. I come from that place and I have no personal problem with it. But I don’t think it is possible to construct a majority today in Spain on that basis. In the UK, the question for Labour has to be: is its tradition still sufficiently embedded within British popular culture that it can construct a social majority around it? If it is, then great. If it isn’t, it has to be abandoned. A progressive alliance, which includes Podemos, has been governing Madrid’s city council for the last three years. Led by Manuela Carmena, the council has secured some impressive gains in less politicized areas. Yet it has also been under constant pressure from the city’s oligarchy and has struggled to advance its program in areas where it would have to confront these elites directly. Clearly local government has very limited powers, but many on the Spanish left have criticized Carmena’s administration as having been too timid. How would you draw up the balance sheet of its first term in office? Many commentators looking in from the outside do not have a real sense of what the daily institutional battle is like. Given the correlation of forces, could we have been a bit bolder? I don’t have the technical knowledge to answer that, but tend to think we could have gone a bit further. Yet I also recognize that one term in government is very little time — in the first year you are finding your feet and discovering how an administration constructed by your adversary functions. The PP spent nearly twenty-five years governing Madrid and building the municipal [government] apparatus. Now you have to take this machine — in which there is no participation, no transparency, and which is weighted towards the interests of the privileged — and keep twisting it in the other direction until it does the opposite. This is the relative autonomy of the state, which is a field made up of competing forces. But winning elections is not winning power. Winning an election is, to use a soccer metaphor, the right to be out on the pitch, contesting the match. If you don’t win elections, you are not even on the pitch — you can sing whatever you want from the stands, but you don’t even have the right to take a shot at goal. So, when you begin to contest the match, to begin the fight, you quickly realize that your team is missing two players, the other team has a stronger goalkeeper, and every foul is going against you. And you need to begin to reverse this. Can it be done in four years? No. Twenty-five years of Madrid’s construction as a neoliberal city can only be reversed via a long-term project. In politics — and above all in government — no battle is isolated. You can’t fight one and then later another as if the two were not connected in any way. If you are governing for the interest of the social majority, you are not going to win every battle. It is like the election of Salvador Allende [in Chile in 1970] — you find yourself surrounded by powers who want to boycott you. So, you can’t win every battle — you should not even consider trying to. You should consider what you can win and then come up with a plan. And you have to be very realistic with this plan because you will probably only be able to win the small battles. The power that a municipal administration wields, for instance, versus that of a finance ministry boycotting you or a coterie of financiers threatening you is very small. Then at the end of your term you have to think: are those at the bottom stronger or weaker now? Do they have more or less protections? And do those at the top still have the same power to twist the hand of the popular will? The institutional battle is not some historical epic, but it is fundamentally important. I always use the same metaphor. We all know of the storming of the Winter Palace in St Petersburg in October 1917. But the radical thing there was not simply capturing the palace, but that there was someone who, while everyone else was celebrating, said: “alright, alright. Tomorrow we have to make sure there is bread in all of the bakeries in St Petersburg — that it is delivered, it arrives, is looked after, that a fair price is demanded.” This is where a movement begins to demonstrate that it is not just a springtime explosion, and that it can build a different order to the one constructed by the elites. In this sense, the most important thing we have done has been to show Madrid’s citizens how we have better-organized its municipal institutions, in contrast to what was done during the decades of mismanagement under the PP — that we are capable of guaranteeing their rights. 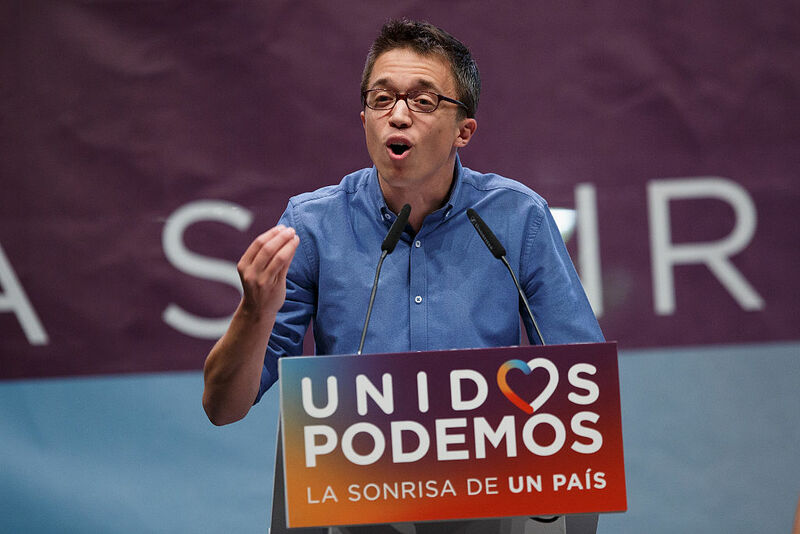 Íñigo Errejón is the co-founder of Podemos.